※Round-trip tickets are not available, so if you need a return ticket, please purchase a one way ticket again. ※Adult passengers may bring one infant with them for free, additional infants require the same fare as that of an elementary aged child. ※If you are traveling in a group then we would appreciate it if you made a reservation. ※We offer discounts for those with physical disabilities.Please show your physical disability certificate at the window. [Set ticket window] On sale! Tickets are not sold at the boarding ticket offices at Momochi, Umino Nakamichi or Hakata Pier, so please purchase them in advance at the above written locations. Please note that tickets can be purchased only in cash. ※ Take a bus from Hakata Station bus terminal and get off at Hakata Pier (the last station). It is located right near where you get off the bus. ※It’s about a 3-minute walk to The Luigans. ※If you are planning to drive to the bay side area to visit Seaside Park Marine World, you can use the parking lot for just 200 yen for the whole day (until 10:00 pm) if you show your parking ticket at the facility office. Usually the rate is 100 yen per 30 minutes. 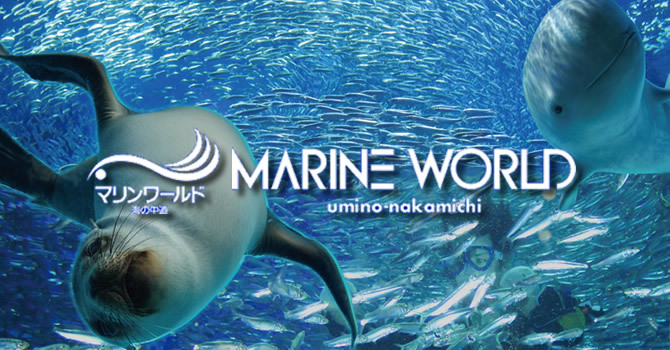 Umino Nakamichi Marine Ecological Science Museum Co,, Ltd. Copyright (c) YASUDA OCEAN GROUP ALL Rights Reserved.